There is a saying save the best for last, my last day at the Evolve Back Resort in Hampi. And the final site seeing trip was the Tungabhadra Trek. Again, it was an early rise, soon after breakfast, we were off. It was cloudy and light showers that day. The temperature was just lovely, yet quite windy. We arrive at the destination, and all around are massive boulders perfectly laid out. The river flowing across was a breathe of fresh air from the rest of the tour. The Tungabhadra River holds important religious significance in the history of Hampi. According to Ramayana the river was named Pampa. The banks of the river have many idols and shrines of Lord Shiva. The river is a union of Tunga and Bhadra river, which flows through the boarders of Karnataka and Andhra Pradesh. The river ultimately joins the Krishna River and ends into the Bay of Bengal. The Vijayanagara Empire thrived and had taken advantage of the river. The kings had constructed a lot of irrigation canals along with aqueducts. Many are still in use today. Once you pass the Hampi Bazaar, Kampa Bupa’s path, you walk along the path that leads to the river is a bit dicey, so please wear non slippery shoes or footwear. I slipped and fell twice inspite of wearing non slippery shoe..opps! Managed to bruise myself on one knee and get scratches on my arms. It was a site for sore eyes for the passerby! But was soon forgotten, as the landscape was so panoramic. It was very windy, and felt like I was getting dragged along my path. The picturesque scenes and the calm around me was just so blissful. I just decided to sit put for a while and let my thoughts drift away. Bhanu, my guide in the mean time kept giving me the background and history behind this magnificent empire and the surroundings. Their way of life back in that era. Thought provoking indeed. A few steps away is an open area, where you find lots of stones and bricks stacked across. Bhanu told me these are mini homes people build and pray to the Gods. Legend has it if you stack or build your home, two floors or three, you wishes do come true. If you are to build one the rule is not to demolish the one which is standing, rather pick up the stones which are around the ground. I had to make my wish and built my mini home. We then walked into a mini tunnel of sorts, and arrived at Chakratirtha one of the holiest places in Hampi. It houses one of the oldest stone temple called Kodanda Rama Temple. It lies between a valley of two mountains, the Matanga Hill and the Rishyamukha Hill. Legend has it that Rishyamukha hill is where Hanuman first met Ram and Lakshman. On the banks of the river you will find rocks that have carvings of Shiva Linga. This area is open to the public and has a full fledged working temple, as I had been there early during the day, it wasn’t crowded. As we proceed, towards the temple path, there was a herd of cows, all walked in a neat line. Next to it, some folks were getting set to take a Coracle ride. 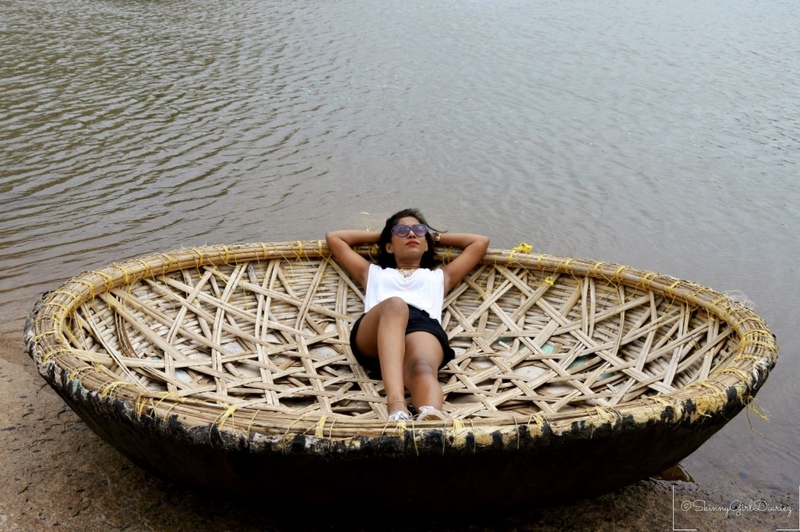 These saucer or bowl shaped boats is made of bamboo, and used to row with a paddle. I just decided to jump onto one of those, for a good picture. My time was too short as I had to get back to checkout. Perhaps, I should take a longer trip next time to enjoy this. From here, we ended up walking along the path, toward the Achuta Raya Temple bazaar street. A must visit site is the Monolithic Bull. But I had my trip cut short as we had a real live bull, so order not to take chances we stepped aside. But did manage to get some few shots of the ancient temple. And just like that my 2.5 days of stay at the regal resort at Evolve Back Hampi, came to a close. I shan’t ever forget this place. I took back a lot of memories and have shared with you each of the trails you can partake whilst at Hampi. I am bound to make another trip there, this time to cover the remainder of places I failed to cover. Drive – The distance between Bangalore and Hampi is about 350 kms. Plane – Fly to Hubli Airport. Hire a cab to drive to Hampi which is about 143km. Bus – Overnight bus journey to Hospet via Bangalore. Then hire a taxi to Hampi. Train – Arrive Hospet railway station, which is about 13 kms from Hampi. If you have stayed at this property, or visited Hampi and its surroundings would love to hear your thoughts, feel free to leave your comments below. Oops! Wear slip-free footwear next time, especially for muddy trails! When walking over rocks on a shallow river though, I’d normally just go barefoot! Haha! That’s quite a cute bowl-shaped raft! Can you take it out to float on? Fascinating resort and loved the wee stone house story as you’re not just observing the ruins and culture but getting involved and sharing it with us. And those round bowl boats/vessels are just stunning.